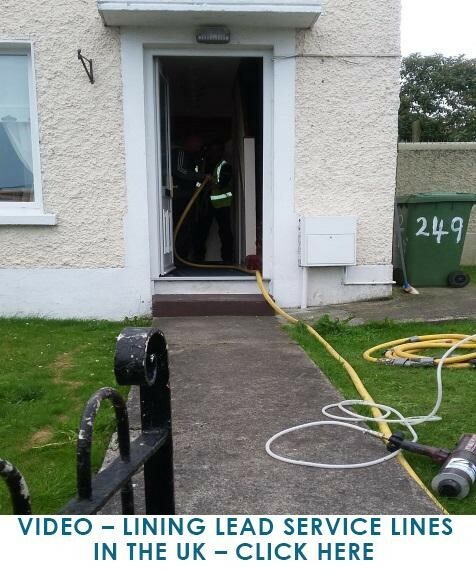 Pipe Restoration Services’, ePIPE Team have been engaged with Irish Water and Dublin City Housing on trial projects in Ireland to demonstrate the effectiveness of lining service pipes using the patented ePIPE solution. ePIPE is an in-place lining process that provides a barrier coating to the inside of lead service lines. The process reduces lead leaching, bringing drinking water into compliance for lead leaching. The process can be completed in a matter of a few hours, typically with no digging or trenching on the customer’s property. The Irish Water Draft ‘Lead in Drinking Water Mitigation Plan’ considers a number of lead mitigation options and epoxy lining of lead services is recognized as a cost effective lead mitigation option. The Dublin City Housing project was conducted in the Cabra West District of Dublin. Service pipes running from the curb stop to the inside of the customer’s home were lined using the ePIPE process. The customer was particularly pleased with how fast the ePIPE process was, with only a 2 hour cure she had her water back on in less than 3 hours with the flow and pressure as good as it was before lining. She particularly expressed herself delighted with how the ePIPE process was completed with no digging or trenching on her property. PRS demonstrated lining up to 15 metres of 1/2″ bore service pipe in one pass. ePIPE is DWI Reg 31(4)(a), WRAS and NSF Std 61.5 approved.